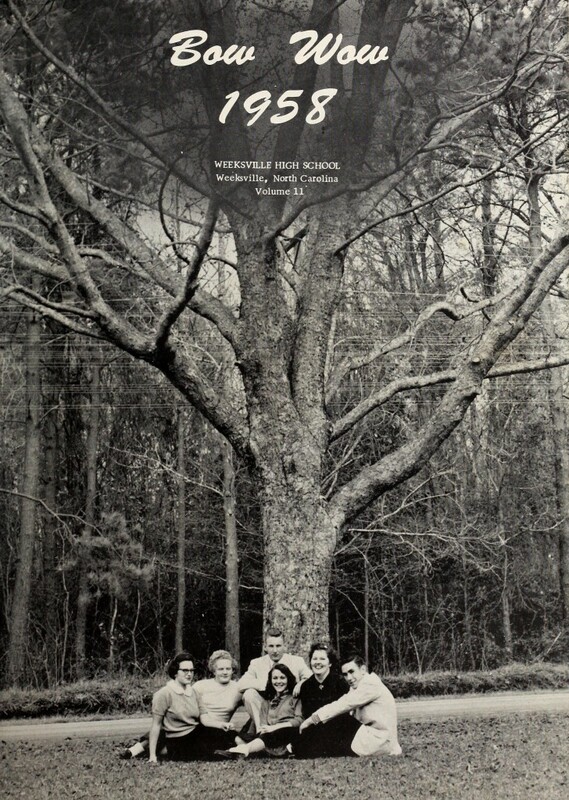 Twelve yearbooks for Pasquotank, Camden, Gates, and Perquimans Counties, and a class reunion book are now online, contributed by the Museum of the Albemarle. With this addition, DigitalNC holds quite a long run for Elizabeth City High School: 1921-1958, with just 6 years missing (1932-1933, 1939-1942). 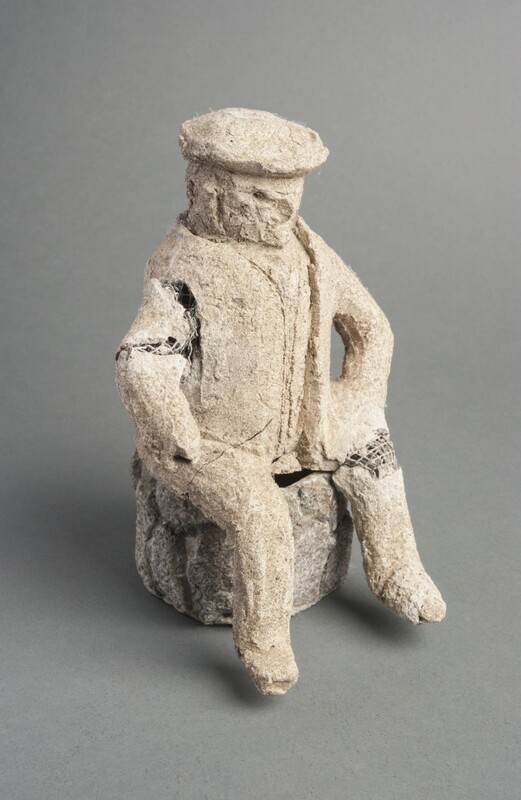 You can also view all items from the Museum of the Albemarle. Coverage of events, profiles of staff, changes in curriculum, and advice to students are common in the newsletters, which were published by the school under a variety of names. The scrapbooks include a number of newspaper clippings documenting the College’s beginnings as an extension of Fayetteville Technical Institute (FTI). 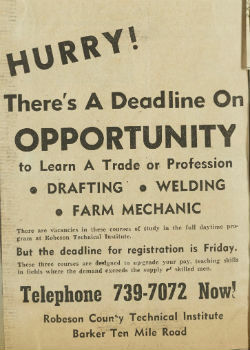 Some of the first classes offered were in the evening, and were weighted toward agricultural interests like Ornamental Horticulture, Farm Business Management, Tractor Electrical Systems, and Fertilizers and Lime. New courses were gradually added, including those in trades, allied health care, and business, as the College grew quickly and became independent from FTI. All of these items, as well as RCC yearbooks, can be seen on DigitalNC. In addition to the excellent music reviews and the hottest fashion tips of 1999, the recently uploaded student newspapers from Wilkes Community College offer an insider’s history of the annual music festival MerleFest. MerleFest began in 1988 and honors the memory of Eddy Merle Watson, son of music legend Doc Watson. What started out as a one-time event to fund a garden for the blind (Merle Watson Garden of the Senses) is now a huge source of income for the county and region. It is estimated that the “traditional plus” festival brings over $10 million to the region (source: MerleFest Reflections). Watch the festival grow through the years in these photographs and articles from the newly-digitized Cougar Cry student newspaper. To see the full-size image, click on the date below the image. To view all items from Wilkes Community College, including yearbooks from 1968-1995, click here. 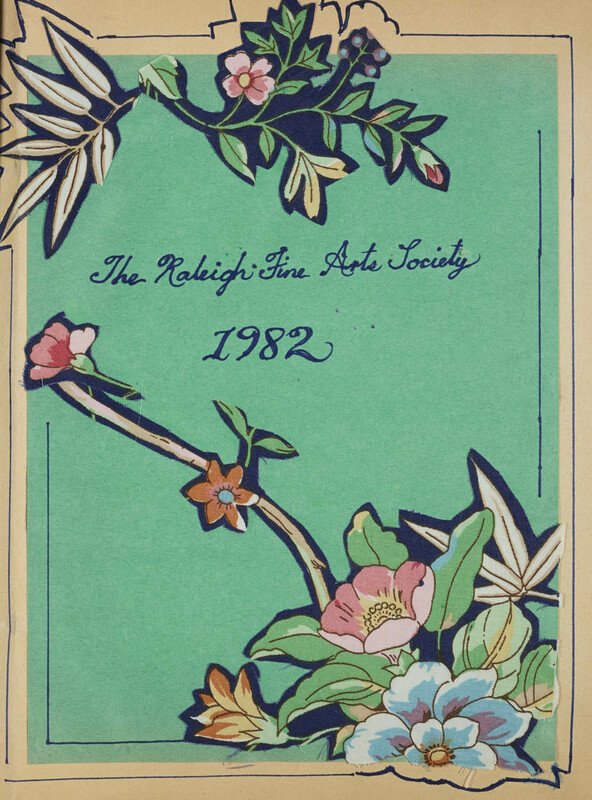 Scrapbooks from the Raleigh Fine Arts Society, dating from 1965-1992, are now available on DigitalNC. The Society, which began in 1964, is a volunteer organization supporting North Carolina arts and artists. Members serve as docents at area institutions, coordinate fundraising for various causes, and hold annual events like the NC Artists’ Exhibition and a High School Literary Contest. The group also holds a number of social events and art exhibits. These scrapbooks document the Society’s history from its early art exhibitions at the former downtown Olivia Raney Library* to its role in local events like Artsplosure. The earlier scrapbooks include newspaper clippings related to women’s changing role in society. Trips that the members have taken together over the years, to places in North Carolina as well as South Carolina and Washington, D.C., are documented through photographs and memorabilia. 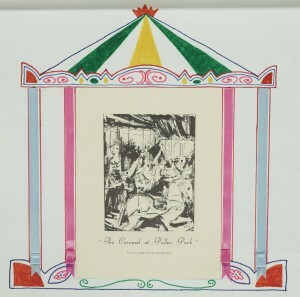 Told throughout the 1970s and 1980s is the story of the Society’s multi-year effort to restore the historical carousel at Pullen Park in Raleigh, an effort that ended successfully in 1982. You can view all of the scrapbooks, which were contributed by the Olivia Raney Local History Library, on DigitalNC. * Thanks to a reader for correcting us on the location of these exhibitions. 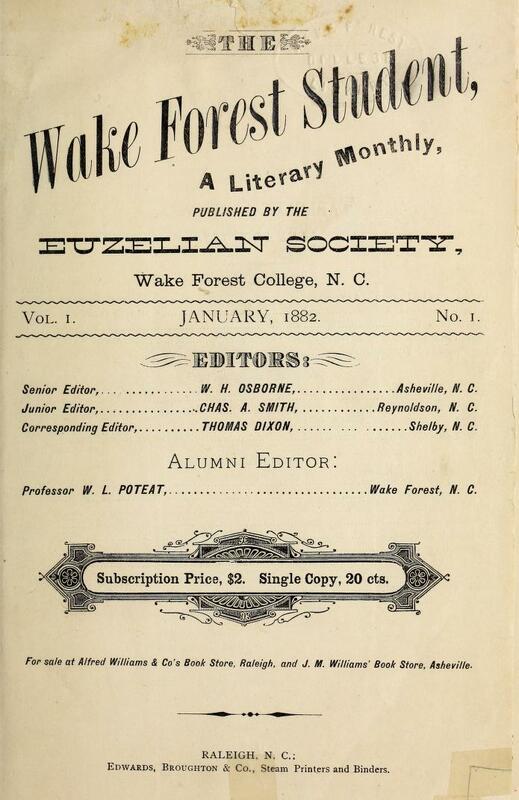 Beginning in 1882, the Euzelian Society at Wake Forest University published a literary magazine, The Wake Forest Student, addressing timely topics on campus and beyond. We’ve just added issues dating from 1882-1891 to DigitalNC. The stated purpose of the Student was “to advance the educational interests of the State, to encourage and develop the taste for literary effort in the students and alumni of the College, and to be a means of instruction and pleasure to all who may read it.” (1882, p. 32) Issues begin with several essays by local authors. Following those are reprints of well-known stories and poems. The “Editorial” section contains traditional editorials along with news items from the College and North Carolina. Alumni were asked to write in, giving a brief account of their activities to be included in each installment. As a side note, the first issues were edited in part by Thomas Dixon, “who later gained infamy for his novel that decried Reconstruction and equality for African-Americans and formed the basis for the film “The Birth of a Nation.” (magazine.wfu.edu/remember/) The very first issue includes an essay on slavery in America. You can also view yearbooks, catalogs, and commencement programs from Wake Forest University on DigitalNC. For now, we’ll leave you with this early sentiment of school pride – and lament – from one of the editors. Page 32 lists the results of an election of officers. Our longtime partner, Wilson County Public Library, recently dropped off a very interesting ledger for digitization. 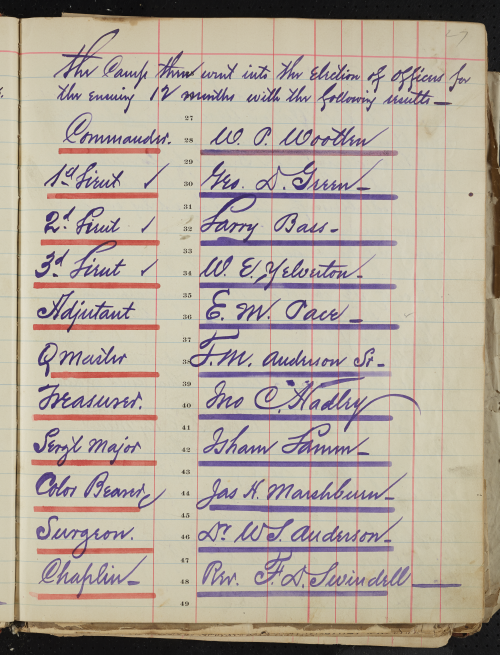 Now on DigitalNC, the ledger for the Jesse S. Barnes Camp of the United Confederate Veterans dates from 1906-1923 and contains minutes, rosters, and other information . Camp members faithfully recorded their activities, changes in membership, as well as the passing of many of their Camp members. There are also several documents related to the national United Confederate Veterans organization. Especially of interest to genealogists are 11 sheets containing the “Record of Lineal Descendants of Confederate Soldiers,” collected in 1918 by a Wilson chapter of the United Daughters of the Confederacy. You can view all items from Wilson County Public Library here. From Carver High School in Mount Olive, N.C., 1961. 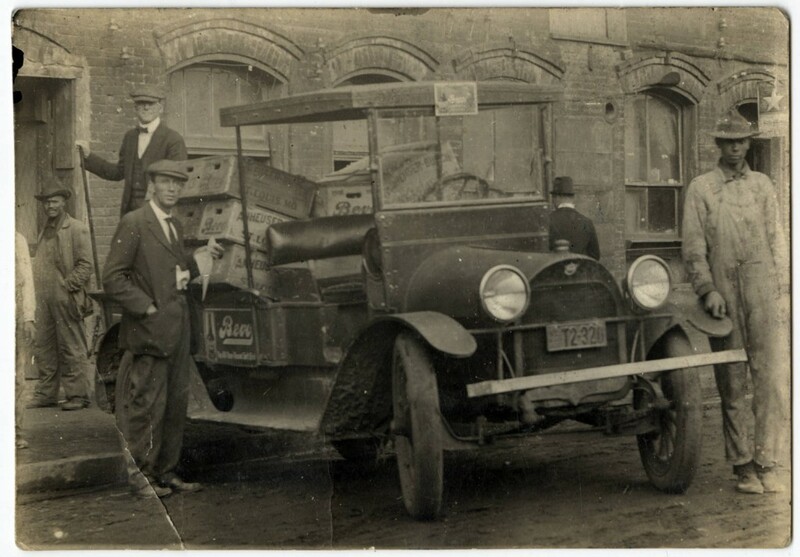 The Digital Heritage Center staff just uploaded several items that brought our partner Wayne County Public Library past a milestone: over 1000 items on DigitalNC! This summer we’ve been busy digitizing a range of Wayne County materials, including school yearbooks and all types of scrapbooks. The scrapbooks range from 4-H club records (pigs galore!) to several on the Major-League Baseball player and pickle salesman Ray Scarborough. 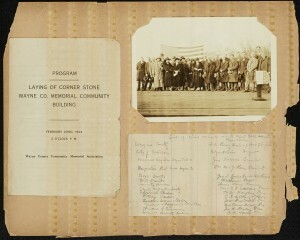 Most recently uploaded are the Wayne County War Memorial scrapbooks from 1923-1925. The two scrapbooks cover the history of the building from inception to completion, and are an excellent record of post-war sentiment in Wayne County. The building, which opened in 1925, was a monument to the Wayne County soldiers who fought in the first world war. For almost 80 years, it functioned as a community center, administrative office building, and recreational facility (an indoor swimming pool was added in 1935). It also served as a monument not only to World War I soldiers but to honor those who served in subsequent wars as well. Sadly, the building burned down in 2004; in its place the Wayne County Veterans Memorial was constructed. For more information on the memorials, visit the Wayne County Veterans Memorial website. Also digitized are several yearbooks from two Wayne County high schools. The African-American Carver High School in Mount Olive, NC now has six volumes from 1959-1964 available, and Pikeville High School in Pikeville, NC has six new volumes from 1958-1961. For all items from Wayne County Public Library, click here. Here on our blog, we occasionally feature “matchups” that showcase relationships between different items in our collection. Today’s matchup? 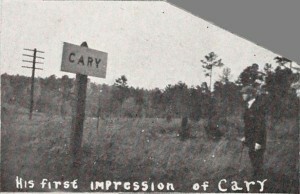 A photograph contributed by Rockingham Community College and several advertisements from the Roanoke News and The Alamance Gleaner newspapers. Bevo did include a small amount of malt liquor, a fact that some prohibitionists felt disqualified it for sale under federal law. 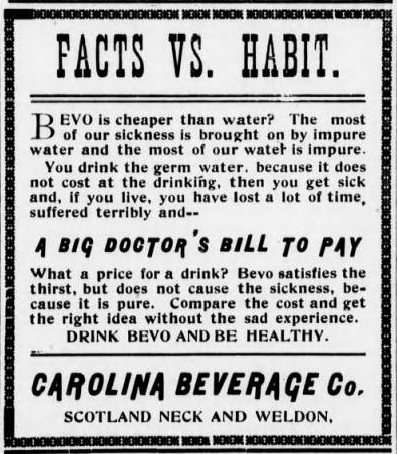 We located an argument in the Biennial Report of the Illinois Attorney General (p. 340-341, 1916) which presents some of the objections to Bevo as well as Anheuser-Busch’s counterargument that the lack of fermentation made it saleable. 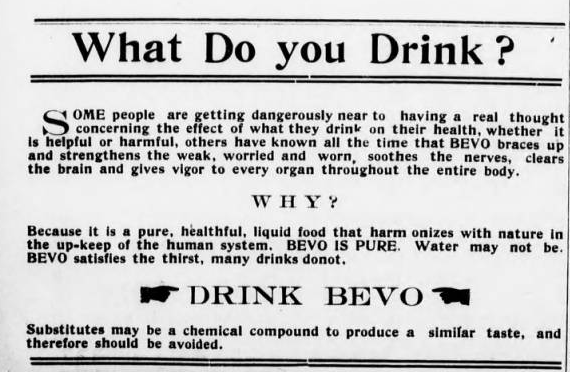 Most localities must have felt Bevo was an acceptable alternative, because it was at least initially wildly popular until its formula changed due in part to the Volstead Act (Bootleggers and Beer Barons of the Prohibition Era, p. 29). While you unfortunately can’t try Bevo today, you can visit it. In St. Louis, near the area where the beverage was produced, stands Anheuser-Busch’s iconic “Bevo Mill” windmill. 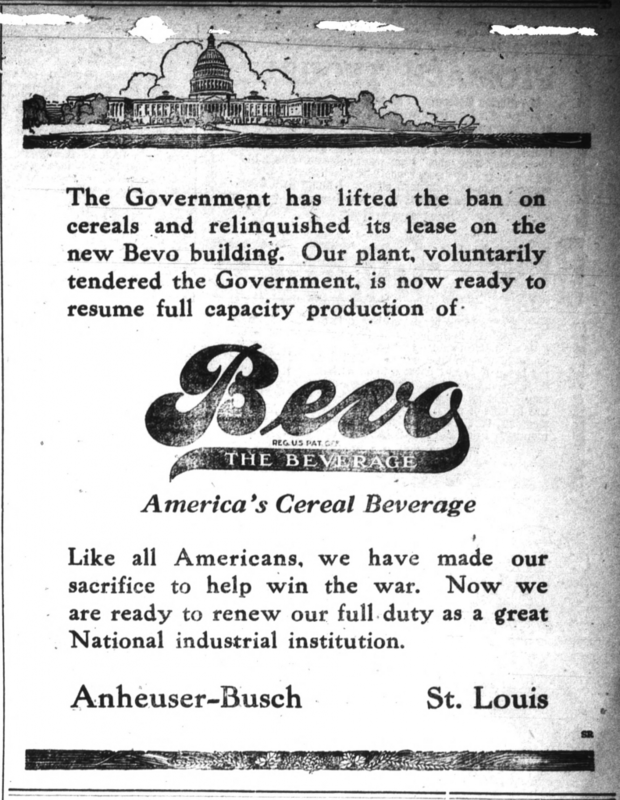 The entire surrounding area is known as Bevo Mill, a testament to a German-American’s attempts at keeping his beer company afloat and popular during prohibition and World War I.